The last couple of months have been interesting to say the least! We’ve had endless issues with Stormy’s back; he seems to keep twisting his pelvis being silly in the paddock! End of July saw us at Monarto for a Pony Club competition. Unfortunately this didn’t go to plan as rumor has it the horses can hear the lions from the nearby Monarto Zoo. Storm was just really unsettled the whole day, and unfortunately this was reflected in our dressage scores. It was our first competition in the novice, and he got really good scores for his leg yield and canter extensions, the two things we thought would bring our score down, unfortunately I just couldn’t keep him focused enough to forget about what was out there. In between times we had a couple of dressage clinics and some awesome lessons with Megan. 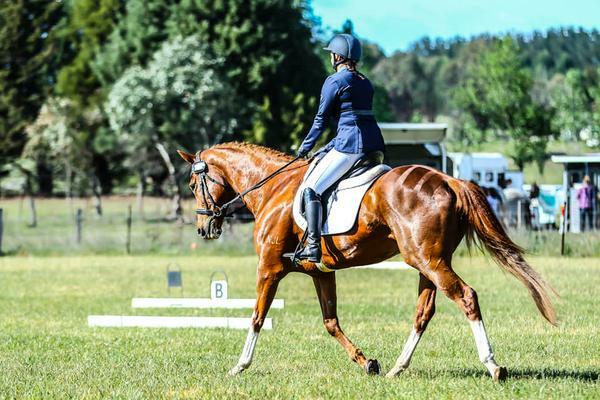 3 weeks following Monarto we competed at a Performance Day in dressage. He had been clipped the day before, and this combined with a slip in the paddock meant he was really bothered and sore during our tests. Our warm up was super, and our first prelim certainly wasn’t our best, however we scored in the high 60’s. The novice followed (it appears to be cursed), and unfortunately Storm wasn’t happy with his back and decided to ditch me mid test. It was a real shame as when we saw the scores later we were doing really well! We decided to finish what we started and competed our last prelim. He wasn’t happy, however he listened and we finished in one piece. A visit to the chiro followed, and much to my delight Storm pulled up really well. That Saturday we competed at an interschool competition, this time back in the show horse. It was HUGE, and Storm was absolutely impeccable. We managed to make it through the final of our Rider over 15 class, and worked our way up to third. We also won the pair of hacks (Stormy was a dwarf) with one of our friends. There was no break for Stormy as the following Tuesday we were training with Megan, and that weekend we competed at Gawler Ag show. Stormy was really really good, and we placed second in open gelding, and I won my junior rider class. He then went Reserve Champion Ridden and I went Champion Rider. We’ve not competed since Gawler, as we wanted to take it right back to the basics for him, however with the ridiculous rain we’ve had here it has been hard to ride. Thanks to flooding, storms and gale force winds, our lead up to Equestrian SA’s Horse of The Year next week has been far less than ideal, but we’re going to give it our best shot. The atmosphere will be huge, so if we can get through the week without him panicking and keep him as focused as possible, then we have already won. This entry was posted in Team Riders and tagged Dressage, Hacking, Jessie Smith, Para Equestrian, Show Horse, Team Wilson Equestrian. Andrea just can’t help getting out and about!